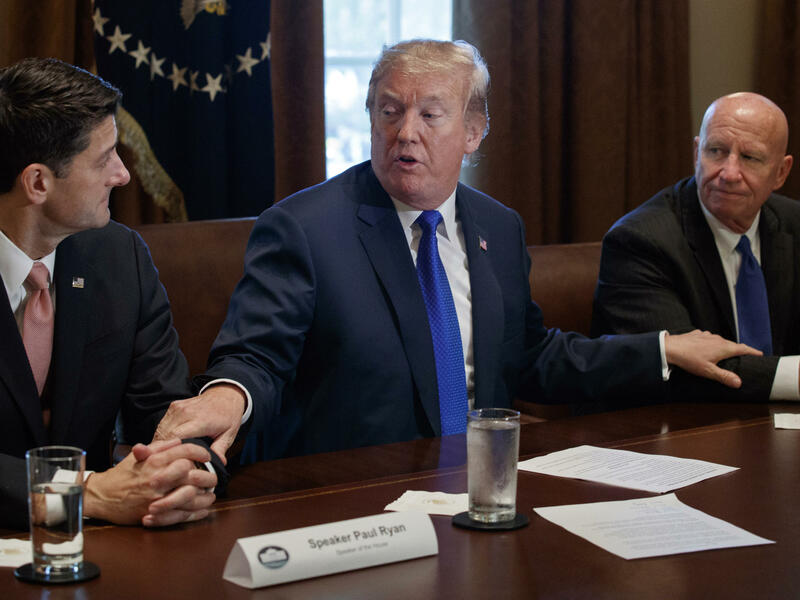 President Trump speaks during a tax policy meeting last November with House Speaker Paul Ryan and Ways and Means Committee Chairman Kevin Brady. "We are extremely worried about the consequences of a trade war and are urging the White House to not advance with this plan," AshLee Strong, a spokeswoman for House Speaker Paul Ryan, R-Wis., said in a statement. "The new tax reform law has boosted the economy and we certainly don't want to jeopardize those gains." President Trump downplayed congressional GOP concerns. "I don't think you're going to have a trade war," he said Monday at the White House, where he defended his decision to crack down on imports. "People have to understand, our country on trade, has been ripped off by virtually every country in the world whether it's friend or enemy. Everybody." The president noted that his efforts to renegotiate NAFTA continue as well. "We are renegotiating NAFTA as I said I would, and if we don't make a deal I will terminate NAFTA," he warned. Congress is not ruling out possible legislative action to counter Trump's actions, although party leaders have no immediate plans to act if the president moves forward this week as stated with imposing tariffs of 25 percent on steel imports and 10 percent on aluminum imports. Ways and Means Committee Chairman Kevin Brady, R-Texas, and the panel's trade subcommittee chairman, David Reichert, R-Wash., have also drafted a letter to the president outlining concerns about new tariffs. They are seeking additional signatures from House Republicans. Aides said lawmakers were hoping to avoid a confrontation with the administration and instead work with the president to enact trade policies the broader GOP can get behind. "As the two chairmen have reinforced, the administration and Congress must work together on trade policies that build off the momentum of the president's tax cuts, which is why any tariffs should be narrow, targeted, and focused on addressing unfairly traded products, without disrupting the flow of fairly traded products for American businesses and consumers," Lauren Aronson, a spokeswoman for the Ways and Means Committee, said in a statement. Senate Finance Chairman Orrin Hatch, R-Utah, is also expected to send a letter to the president this week asking him to reconsider his position. Hatch opposes new tariffs because he believes they will undermine any economic boost delivered by the GOP's tax cuts. "Should the administration opt to move forward with tariffs on steel and aluminum, American manufacturers, businesses, and consumers would be forced to bear the brunt paying more for steel and steel products. Such action could very well undercut the benefits of the pro-growth tax reform we fought to get on the books," Hatch said in a weekend statement. The White House showed no indication Monday that the president was considering changing his mind. "The president is resolute about this, and no one should be surprised either at that resoluteness or the fact that it's going to happen," said National Trade Council Director Peter Navarro, a top Trump aide who, along with Commerce Secretary Wilbur Ross, has been the strongest administration advocate for new tariffs. "Understand that all the rhetoric that's being generated about this is being generated by the lobbyists on K Street and the politicians who are fundamentally opposed to what the president wants to do on behalf of the American worker and on behalf of the country," Navarro said. "This is a very well-informed decision." Trump's decision is the starkest break from traditional GOP economic philosophy on trade since taking office. The president has found few GOP allies on Capitol Hill, but Rust Belt Democrats up for re-election this year cheered the administration's decision. 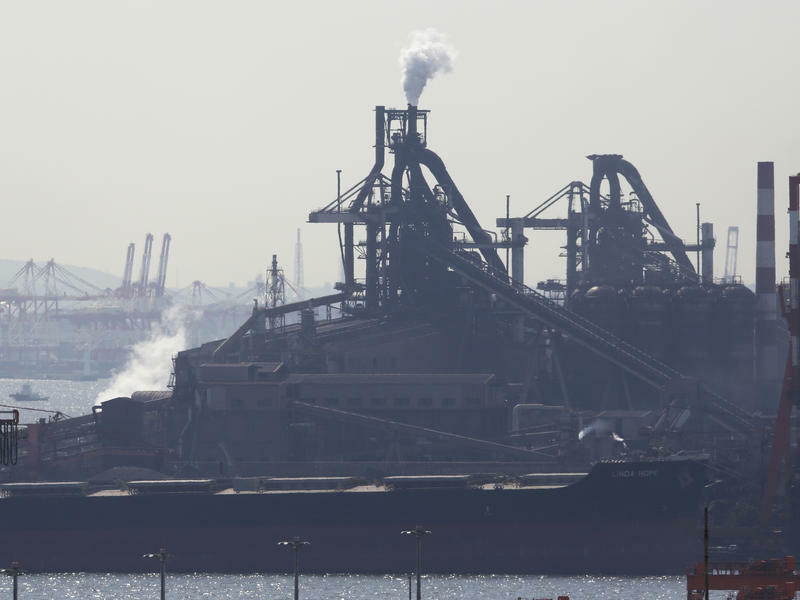 "This welcome action is long overdue for shuttered steel plants across Ohio and steelworkers who live in fear that their jobs will be the next victims of Chinese cheating," said Sen. Sherrod Brown, D-Ohio. Likewise, Sen. Bob Casey, D-Pa., called Trump's decision a "welcome step." Republicans were frustrated and taken by surprise by the timing of the president's announcement last week that steel and aluminum tariffs were imminent. Republicans generally support a more targeted approach to pushing back on cheap foreign imports — a message they delivered directly to Trump in several recent meetings. South Dakota Sen. John Thune, one of the top Republicans in the Senate, was among those who were caught off guard last week when Trump made the announcement. "I don't know how to explain it because I've been in meetings with him on trade," Thune told reporters. "Everybody's been very clear that we think some of the decisions that they're talking about making and policies they're talking about implementing would be very harmful to the economy at a time when it's really taking off." Sen. Lindsey Graham, R-S.C., has argued that a blanket tariff fails to directly punish countries like China for dumping low-cost steel in the American market. Graham said Sunday that Trump would "let China off the hook" while punishing U.S. companies that sell goods abroad by inviting retaliatory tariffs from other global trading partners. "The reason our steel industry has been decimated is because of China dumping," Graham said in an interview on CBS's Face the Nation. "China produces more steel than the world consumes for several years in a row. China is your problem, Mr. President." Congress technically has legislative options to counter Trump's tariffs if he moves ahead with them despite opposition, but it would require a somewhat extraordinary move on the part of Republicans to craft legislation cracking down on their own president in an election year. Republicans would also likely need vetoproof majorities in both chambers to have any effect. And any legislative move would also upend orthodoxy on trade policy, which is generally enacted with the view that the president should be given latitude to manage international trade.